I love making grain-free cookies! They are so quick & easy to make and I usually have everything needed on hand. AND I absolutely LOVE that these nut-based cookies are packed with nutrition, so I can feel good about serving them to my family. 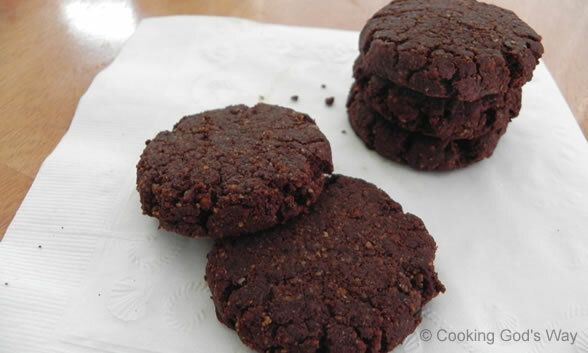 These delicate chocolat-y cookies are a yummy treat any time of day! Preheat oven to 350F. Line a baking/cookie sheet with parchment paper, set aside. Place all dry ingredients in container of food processor, pulse until well combined. With machine running, drizzle in melted butter/oil. Add in egg and vanilla and process until mixture clumps together. Scoop out 1-Tablespoon sized portions of dough, gently form into a ball with your hands and place on prepared baking sheet, a few inches apart, repeating until sheet is full. Bake cookies in preheated oven 5 minutes, then flatten the cookies with the bottom of a flat glass or measuring cup. Continue baking for 5 to 8 minutes more until the cookies are firm at the edges and slightly soft in the center. Remove to a cooling rack and allow to cool completely. Makes approx. 2 1/2-dozen cookies.